Hot cross buns are a staple of the Easter holiday season. 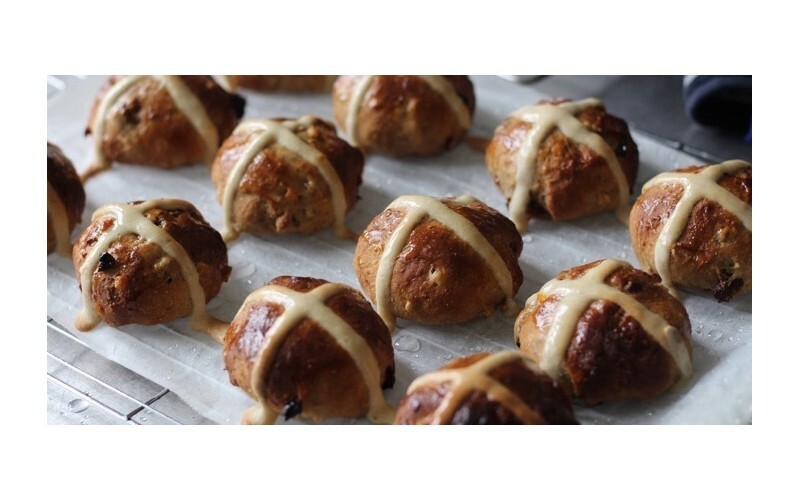 This is the vegan version of our classic hot cross bun recipe which proves that you can make moist delicious hot cross buns without milk, eggs, or butter. We like to include dried apricots and mixed peel for added interest and distinctive flavour. Give them a try! In a measuring jug combine the water, warm almond milk, yeast and sugar, mix well and leave in a warm place for about 10 minutes for the yeast to start to bubble. Pour the flours and salt into a large bowl and make a well in the centre. Pour in the milk and yeast, the applesauce and oil. Using one finger stir in the liquid until the dough is coming together, then use both hands and start to knead. Turn out the dough onto a lightly floured flat surface and knead, using your fingers to stretch the dough up and then gently fold back. It will be sticky to begin with so don’t be tempted to add too much flour, use a bread plastic scraper if the dough sticks to the work surface. Knead until smooth and elastic, usually about 10 minutes. Place in an oiled bowl and cover with oiled cling film. Leave to rise in a warm place for 1 – 1½ hours, until doubled in size. Turn the dough out on a lightly floured surface and gently knead the dough. Roll the dough into a sausage and divide up into 16 equal pieces (you can use scales to be precise). Roll each piece into a round ball. Line two baking trays with baking parchment and arrange the balls in lines, not quite touching. Leave in a warm place to rise for 45 minutes to an hour or until the buns have doubled in size. While the dough is rising preheat the oven to 200°fan/220C and make the piping paste. To make the piping paste, mix the flour sugar and water together into a smooth paste. Put into a piping bag fitted with a small, plain nozzle. When the buns have risen, make an indent of a cross on each bun using a blunt knife and pipe a cross on each bun. Put the buns in the oven and bake for 15-20 minutes or until they are golden brown and sound hollow when tapped. While the buns are baking, make the sticky glaze. Dissolve the sugar in the water over a low heat. As soon as the buns come out brush them with the glaze. Transfer to a wire rack without pulling them apart and leave to cool. Best eaten whilst still warm, or store in an airtight container and serve warmed gently in the oven.